Nathan's Famous started in 1916 when Feltman's Restaurant worker Nathan Handwerker quit with $300 in savings to open a competing hot dog stand with his wife at the corner of Surf and Stillwell. Nathan sold hot dogs for five cents versus Feltman's ten cents. This made potential customers question the quality of Nathan's meat, which at the time actually was a real consideration. Nathan's stand sat empty until it became the go-to spot for doctors almost overnight. People came in droves once they saw doctors ate there. Someone eventually realized that Nathan had just hired unemployed men to put on doctor costumes and eat all day at his stand. By then, though, it was so popular it didn't matter. So while Charles Feltman invented the hot dog, Nathan gets all the credit because he made it famous by appealing to the masses. 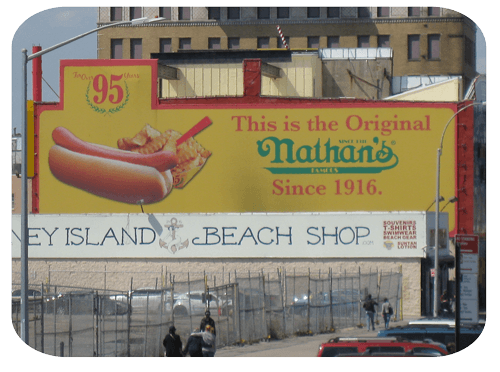 There is a modern Nathan's within the original Nathan's building, located at the corner of Surf Avenue and Stillwell Avenue as you exit the Coney Island subway station. Every July 4th, the Nathan's Famous Hot Dog Eating Contest takes place here. 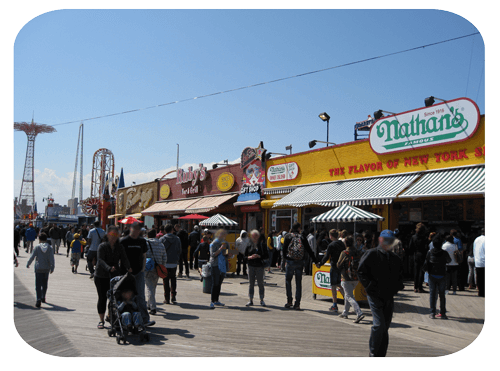 Another Nathan's is on the boardwalk. Original Nathan's on Surf Avenue, viewed from the boardwalk. Nathan's on the boardwalk, next to Lola Star and Ruby's.